Health equity means achieving the conditions in which all people have the opportunity to realize their health potential — the highest level of health possible for that person. Health equity is an issue of justice. Health status is determined by where people live, their income and how they are treated by other people. Addressing health equity requires recognizing that not everyone has the same opportunities to make healthy choices. 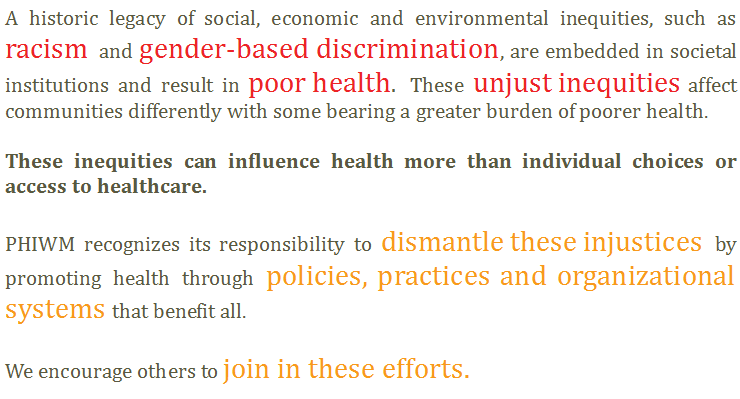 A commitment to Health Equity requires taking bold action to eliminate barriers to basic human needs that create “unnecessary, avoidable, unfair, and unjust” health differences between populations. We work with local residents and communities experiencing inequities to ensure meaningful participation in all of our work. We commit to life-long learning to advance our individual and organizational knowledge of cultural humility, white privilege and internalized racial oppression. These strategies enable us to bring people together in our region to build measurably healthier communities. We can only achieve health equity when “everyone has the opportunity to attain their full health potential,” regardless of their race, gender, education, sexual orientation, or economic background. Expanding these opportunities requires thinking beyond “one size fits all” strategies that don’t take into account the reality that every individual starts at a different place in life and has a unique set of circumstances and needs affecting his or her health. 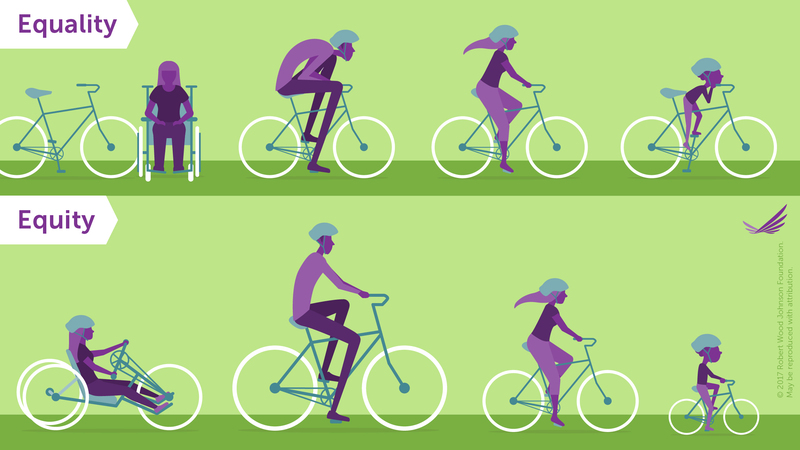 As demonstrated in the image below, a “one size fits all” approach to health is a lot like providing everyone with the same bicycle, regardless of their height, age, or physical needs — factors that have a substantial impact on an individual’s opportunity to actually use the bike provided. On the other hand, an equity-driven solution would work to ensure each individual has the resources he or she specifically needs to achieve a shared objective. By providing everyone with a cycle specifically suited to their needs, all individuals have the opportunity to actually ride. Health Equity event held at FRCOG for regional CHNA groups on June 14th.